On the 19th of March, Chesapeake Earth First! entered the building housing Hill & Knowlton, lobbyists for Enbridge. 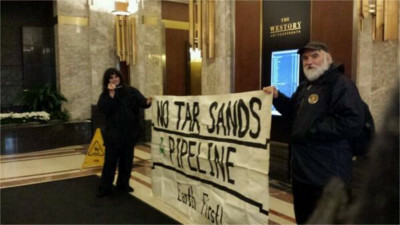 This was in response to a First Nations call for solidarity actions against Enbridge for reversing the flow of their old #9 pipeline to carry tar sands oil. Chesapeake Earth First! unfurled a banner and demanded that someone from the Hill & Knowlton offices on the 3ed floor come down to meet with them. A security guard passed the message, but the meeting was refused. When protesters left the building, that same security guard found himself under orders to attempt to intimidate protesters into not standing in front of the building. This order was defied, inducing protesters to stick around in the cold and damp longer than had been intended. Finally, the security guard went back inside, the police refused to show, and protesters left with a loud and clear message sent. Hill & Knowlton Strategies, as they are listed on the building plaque out front, has a long and sordid history of representing the worst of the worst. They represented Big Tobacco during those lawsuits, and two infamous lies on behalf of other clients have been traced to their offices. During the famous "Redwood Summer," fake Earth First! fliers threatening violence appeared, they were later traced to Hill & Knowlton Strategies. Far worse than that, the infamous and proven false claim that the Iraqi military killed Kuwaiti babies in incubators has also been traced to them. In short, they are the Blackwater of lobbyists, the worst of the worst.